Welcome to LondonTickets.com, where you can book your tickets securely and conveniently for top attractions, sightseeing, and transport in London, including the London Eye, Madame Tussauds, the Harry Potter & Warner Bros. Studio Tour, and much, much more. London has something for everyone, with plenty to see and do for kids and families. Book your tickets here and enjoy an unforgettable time in London! Book your tickets online and get a timed ticket, so you can skip the long lines. The world-famous Madame Tussauds is so much more than a wax museum. There are no ropes! You can touch the figures, take your photo with your biggest celebrity crush and enjoy the many different interactive exhibitions such as Spirit of London Taxi Ride and the Star Wars Experience. Experience the magic and see where the Harry Potter films were made! Fun for Harry Potter fans of all ages, Warner Bros. Studio gives you a behind-the-scenes look at how the films were made, including props, sets, and costumes, and includes round-trip transportation from London. Book your tickets in advance! 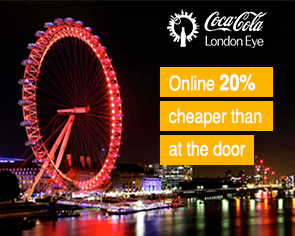 Visit two of London's most popular attractions - Madame Tussauds and the Coca-Cola London Eye and save 40%! Book your 2-in-1 London Combo Package online and save up to 40% compared to buying the tickets individually at the door. Experience the amazing view over London from the London Eye! Book your timed tickets from home and save up to 20% compared to the price at the door, and avoid lines to the ticket office for your best value option! Purchase tickets to the Tower of London and learn all there is to know about this nearly 1,000 year old historical site by linking up with Yeoman Warder tour. Skip the lines at the box office, book today! Save time and money with the London Pass! Providing entry to over 60 top attractions, tours, museums and sights in London and Fast Track Entry to a selection of the most popular attractions, you may choose between 1, 2, 3 or 6 day options to best fit your London itinerary. "It was a nice trip."